Our Best-Selling Trash Bins Now Come With Larger Containers! Our Large Wood Tilt-Out Trash Bin is still the same solid pine construction, but we're now including a larger trash can so you can toss, sort, or store even more! With our tilt-out design, the top of the trash bin stays stationary, stands at counter height, and can be used to hold a microwave or other small appliance, serve as additional counter space, or be paired with one of our top hutches for more shelf space. If you have limited space, and are looking for something a little smaller, check out our #74 - Small Wood Tilt-Out Trash Bin, or #74s - Small Wood Tilt-Out Trash Bin with Shelf. Sawdust City Tilt-Out Trash Bins do not use highly processed wood. The final look and finish is intended to be rustic and aged, with visible knots and other minor imperfections. 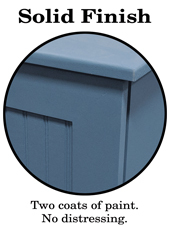 Our Solid finish provides a more clean and modern look, but our finish is NOT like a veneer. Although this garbage cans seems expensive it’s definitely worth the money! I wanted a garbage can that was discreet and looked more like furniture than the traditional type. This was perfect. It looks nice in my kitchen and doesn’t look cheaply made at all. It’s very heavy, sturdy and well-built. This item was delivered promptly and is very solid. It was easy to put together and I like the height but did add wheels to clean behind it. I ordered this trash bin in the color "Solid" tangerine. The description for "Solid" says "Our "Solid" finish is two solid coats of paint with no distressing." The insert that listed how many coats were applied only had the initials "pc" next to Painter. There were no initials next to 2nd coat. At least there was touch up paint to easily match the color when purchasing paint for a second coat. The box also had a small package of 4 rubber stoppers inside that don't seem to have anything to do with a trash bin. I bought this as a Christmas gift for my daughter. My husband does woodwork and didn't have time to make one before christmas. I was concerned about paying the price but both my husband and I are very impressed with the quality and attention to detail. Can't wait for her to open it on Christmas day. Got a small kitchen...... (especially) this is the way to GO! As one other reviewer notes below - I never thought I'd say how much i LOVE a trash can! First, when it was received (in a very timely manner) I opened the well cushioned box to get that "ahhhhhh" smell of the local hardware store wood aisle - FRESH wood! It came out of the box easily and with a few turns of a screw driver to move the handle from the inside of the bin to the outside (smart!) and super small other assembly items (nice touch with....well, touch-up paint!) I was ready to go! It matches my white cabinets in my 750 sq. foot apartment PERFECTLY! it pulls double duty with my microwave (0.7 sq. ft) sitting on top! It has a lovely small shelf as pictured above to hold your spare trash can liners. My kitchen is galley style so every inch counts in maximizing space! I saved a counter by not having to put a microwave on it!! I am externally pleased with the solid construction. I can see the person making it by hand with care and love!! My grandfather and older brother do woodworking and it's amazing what goes into any one project. Thanks so much for making such a quality product! I don't usually write reviews, but this deserved one. This is a very good quality trash bin. The only assembly required was to install the top with 6 wood screws. That's it! The customer service was also quite accommodating in leaving the knob handle off so that I could install one that matched our existing handles. There was a small jar of stain included for touch-ups if needed. Some knots hat bled through so the stain came in handy for that too. I installed some plastic contact paper on the inside of the door to help in cleaning any spillage and also put a couple of stick-on cabinet bumpers near the top door. The included plastic trash can works great but an even larger one would probably fit. Very nice product! Thank you! Functional and looks great! Nicely made, and a great design. This is a piece that I will have for many years. Ordered it on a Sunday, and it was waiting on my porch on Friday when I came home from work. I do live in WI , so that may be part of the quick delivery, but a nice surprise. It was well packaged, and easy to assemble. Love that it is made in Wisconsin. Also came with a cute sign that I put in my kitchen. Well built, very nice, and reasonable shipping and handling. When I called the office they were very pleasant and helped me get the information i was looking for. I ordered our bin unfinished, and it came all set for me to stain. This piece is built to last well worth the money, Plus it holds a nice big garbage can. We will order from this company again. I've never uttered these words "I love my trash can! "...until NOW! + It's counter top height. + It's made in the USA!! + It comes assembled (okay I had to screw the top on and reverse the knob to the outside, but it was super simple to do). + It is solid state, all wood, no particle board. + It looks great in the kitchen. + It was packed very securely (my kids had a blast popping all the bubble wrap). + It comes with the plastic trash can inside it (many I had researched did not). + I had the opportunity to interact with Shannon about my order, and she was super helpful, quickly responded to all my inquiries, and delivered exactly as she promised. + There was a surprise gift included with my order - thank you! !